Kenneth Adolphe Slessor OBE (27 March 1901 – 30 June 1971) was an Australian poet, journalist and official war correspondent in World War II. He was one of Australia's leading poets, notable particularly for the absorption of modernist influences into Australian poetry. The Kenneth Slessor Prize for Poetry is named after him. Slessor was born Kenneth Adolphe Schloesser in Orange, New South Wales. As a boy, he lived in England for a time with his parents and in Australia visited the mines of rural New South Wales with his father, a Jewish mining engineer whose father and grandfather had been distinguished musicians in Germany. His family moved to Sydney in 1903. Slessor attended Mowbray House School (1910–1914) and the Sydney Church of England Grammar School (1915–1918), where he began to write poetry. His first published poem, "Goin'", about a wounded digger in Europe, remembering Sydney and its icons, appeared in The Bulletin in 1917. Slessor passed the 1918 NSW Leaving Certificate with first-class honours in English and joined the Sydney Sun as a journalist. In 1919, seven of his poems were published. He married for the first time in 1922. Slessor made his living as a newspaper journalist, mostly for The Sun, and was a war correspondent during World War II (1939–1945). In that capacity, he reported not only from Australia but from Greece, Syria, Libya, Egypt, and New Guinea. Slessor also wrote on rugby league football for the popular publication Smith's Weekly. The bulk of Slessor's poetic work was produced before the end of World War II. His poem "Five Bells"—relating to Sydney Harbour, time, the past, memory, and the death of the artist, friend and colleague of Slessor at Smith's Weekly, Joe Lynch—remains probably his best known poem, followed by "Beach Burial", a tribute to Australian troops who fought in World War II. ...a city lover, fastidious and excessively courteous, in those qualities resembles Baudelaire, as he does in being incapable of sentimentalizing over vegetation, in finding in nature something cruel, something bordering on effrontery. He prefers chiselled stone to the disorganization of grass. Ronald McCuaig was the first to produce an in-depth review of Kenneth Slessor (in The Bulletin in August 1939 and republished in "Tales out of bed" (1944)). The review was favourable, ranking Slessor above C.J. Brennan and W.B. Yeats. It was written a year before "Five Bells", which marked Slessor's move to modernism, a move inspired, according to Rundle and others, by McCuaig. The review therefore covers the pre-modernist parts of Slessor's poetry. According to poet Douglas Stewart, Kenneth Slessor's poem "Five Visions of Captain Cook" is equally as important as "Five Bells" and was the 'most dramatic break-through' in Australian poetry of the twentieth century. In 1944 he published his definitive volume of poetry, "One Hundred Poems", and from that point on Slessor published only three short poems. Instead of writing poetry, after 1944, and for the rest of his life, Slessor chose to concentrate on journalism and supporting literary projects whose aim was to help develop Australian poetry. In the 1959 New Year Honours, Slessor was appointed an Officer of the Order of the British Empire (OBE) for services to literature. Slessor counted Norman Lindsay, Hugh McCrae and Jack Lindsay among his friends. At the age of 21, Slessor married 28-year-old Noëla Glasson in Ashfield, Sydney, on 18 August 1922. Noëla died of cancer on 22 October 1945. Noëla Beatrice Myer Ewart Glasson (born 1894) was the daughter of Australian soprano and music composer Annie May Colette Summerbelle (1867–1949) and Herbert Edward Glasson (1867–1893), who was later convicted of murder. He married Pauline Wallace in 1951; and a year later celebrated the birth of his only child, Paul Slessor, before the marriage dissolved in 1961. He died alone and suddenly of a heart attack on 30 June 1971 at the Mater Misericordiae Hospital, North Sydney. One Hundred Poems, 1919–1939, Sydney: Angus & Robertson (1944); revised edition published as Poems, 1957; new edition published as Selected Poems, 1978. Slessor has a street in the Canberra suburb of McKellar named after him. Kenneth Slessor Park in Chatswood in named in his honour; the park features architecture with his poem, "Five Bells". The 1988 musical Darlinghurst Nights is based on his poetry and he is featured as a character. The bells motif in "Five Bells" is referenced at the end of the 1999 song "You Gotta Love This City" by The Whitlams, which also involves a drowning death in Sydney Harbour. Slessor's poetry was chosen to be placed on the Higher School Certificate English reading lists, and was also examined in the final English exam. 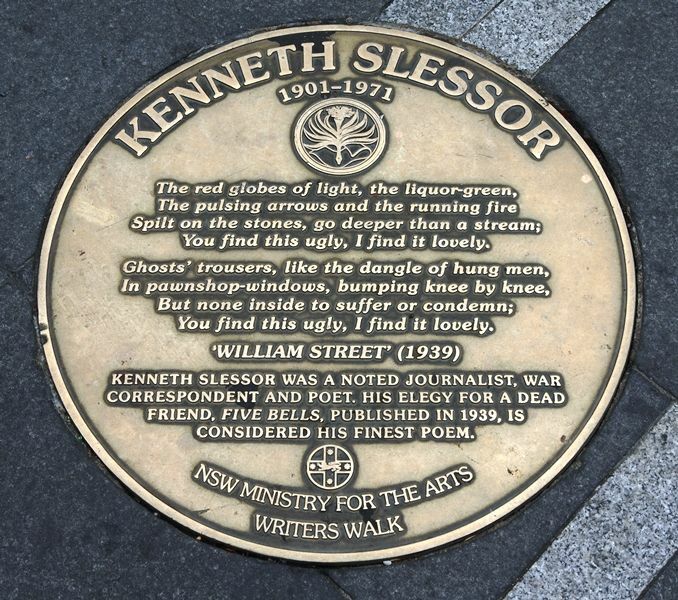 Kenneth Slessor has a plaque dedicated to him on the Sydney Writers Walk at Circular Quay. ^ a b c d "MS 3020 Papers of Kenneth Adolf Slessor (1901–1971)". National Library of Australia. Retrieved 29 August 2008. ^ a b c d Haskell, Dennis (2002). "Slessor, Kenneth Adolf (1901–1971)". Australian Dictionary of Biography. Canberra: Australian National University. ^ Headon, David (October 1999). "Up From the Ashes: The Phoenix of a Rugby League Literature" (PDF). Football Studies Volume 2, Issue 2. Football Studies Group. Archived from the original (PDF) on 10 August 2010. Retrieved 7 July 2009. ^ "Tales out of bed / by Ronald McCuaig | National Library of Australia". catalogue.nla.gov.au. Retrieved 16 May 2016. Dutton, Geoffrey (1991). Kenneth Slessor: A Biography. Ringwood, Victoria: Viking. ISBN 9780670832682. Slessor, Kenneth; Dennis Haskell; and Geoffrey Dutton. 1994. Collected Poems. Pymble, Sydney: Angus & Robertson.